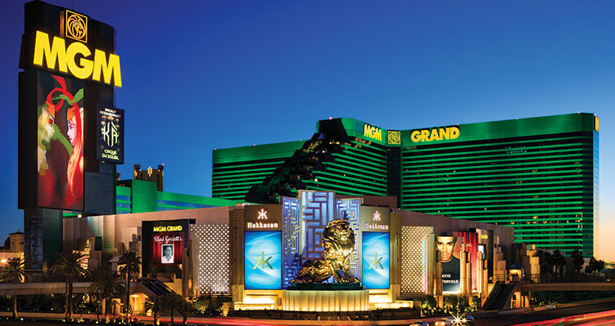 The ever famous MGM Grand Casino which is located downstairs, has some of the most state of the art gaming technology. Roulette, Blackjack, Baccarat, and Casino War are just some of the numerous games that are played throughout the casino. The MGM Grand Casino is said to have the largest selection of slot machines out of all the casinos in town. The most prized of all the gaming in the Casino is the Grand Poker Room. It is unmatched for comfort, and fast paced action. It is also open 24 hours a day. Some of the more popular poker games that are played include 7-Card Stud and Texas Hold ‘Em. No Limit Hold ‘Em tournaments are played vigorously throughout the year at the casino, and they even have licensed massage therapists at the table to help relieve the players’ stress. Some of the finest dining in Las Vegas can also be found at the MGM Grand. Famous Chef Emeril Lagasse is the executive chef in charge of preparing the meals, whether he is personally cooking or overseeing his staff. Some of the fine fare includes scallops that are shipped all the way from Maine and prepared as a main dish, Pike fish caught and brought from the Midwest, Chef’s famous cooked Alabama chicken. Chef even makes his own fresh blend of Creole/Cajun cuisine, which is said to be notably better than anything prepared in a French Quarter Restaurant. He also serves a distinctive wine that won a Spectator’s Best Award of Excellence back in 1999. Las Vegas is a town where there never seems to be a bored person. The city offers such an array of nightclubs that anyone can get out and enjoy the nightlife. Whether you are out to meet someone, go dancing or just sit around in a lounge, there are plenty of venues to choose from. Probably the most popular and famous of all the nightclubs in Vegas is Studio 54 at the MGM Grand. It boasts some of the most luxurious accommodation in hotel life. The Grand Tower is probably the most popular out of all of them, providing Bungalow suites, Celebrity Spa suites, Glamour suites, you name and they’ve got it. The Grand Tower houses some of the larger than average rooms of 446 square feet and all have black and white marble bathrooms, enormous closets, remote control televisions, clocks and even safes. Every room is also equipped with high speed internet access. The MGM Grand is the one place for anyone’s event needs. From intimate settings to large productions, the MGM Grand is staffed and ready to take care of your special events. Their mission is to deliver to their clients the excitement unbeatable service that the MGM Grand tradition demands. It has always been their mission to provide the best and most luxurious service that anyone could offer which is probably why they are rated the number one place in Las Vegas to spend a vacation. From lush relaxation in their pampered rooms to going downstairs and hitting the gambling scene, to shaking it all off in one of their fine dining restaurants, enjoying some of the best food money can buy, it is well worth anyone traveling there at least once.